On the hottest summer days attending/hosting events is a pain in the neck, but it doesn't have to be that way. Inflatable misting tents can make that all go away. Every misting unit can be customized with your preferred imaging, logos and signage. Need it to match your company's brand identity, we can do it. Just let us know how you want to design it and we'll help you throughout the entire process. Staying out of the sun is invevitable sometimes. On hot days where it feels like you can cook an egg on the sidewalk you want nothing better than to cool off. Misting tents are perfect for that because they are easy to install, operate, and put away. All you need is a water line nearby and a power outlet and you're in business. These inflatable structures provide multiple misters around the tent to keep everyone passing through nice and cool. Have a lot of people? No problem, we can make these as big as neccesary to accomodate your needs. "The cooling mist feels nice." Our inflatable misting tents come with cool stuff already packed in. 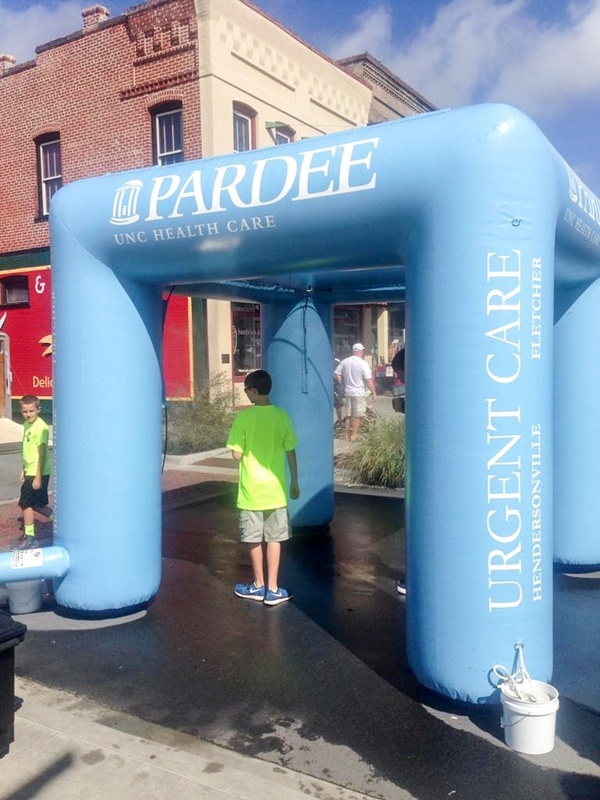 Adding a personal touch to an inflatable misting station goes a long way. We offer stock, non printed, misting units but they are a little bland and could definitely use some color. Due to the fact that they are white they get noticeably more dirty. When you introduce imagery and logos to a misting station it will look far more aesthetically pleasing. Not only that, but it will also be more eye catching to those attending an event. The fact that it spews water in a fine mist is attractive to anyone experienceing a hot day but when you add colorpful graphics it becomes more inviting. If you have a certain design in mind we can help you with image placing and layout options or you can take the creative reins and personalize it yourself. The misting system on the inflatable mister is easy to maintain, use and store. To start, every tent mister comes in a heavy duty case where all of the misting parts are stored. The Inflatable comes in a separate vinyl bag that protects it from ripping and scratching due to rough handling. The inflatable is very easy to clean, should it get messy with dirt or other unwanted substances. A wet shop towel should do the trick. Installing it is very easy as you just unroll it from the bag, plug it in, and secure it to the ground. Once that is ready (this should take about 5-10 mins.) you attach the misting unit to the inflatable tent. Then all you need to do is plug it into a water line and a power outlet. What's left? Turn it on and cool off. Putting it all away is just as easy. Just make sure to dry the inflatable, which shouldn't take long or be difficult and roll it into the original bag it came in. As for the rest, just place it in the heavy duty case and Viola! 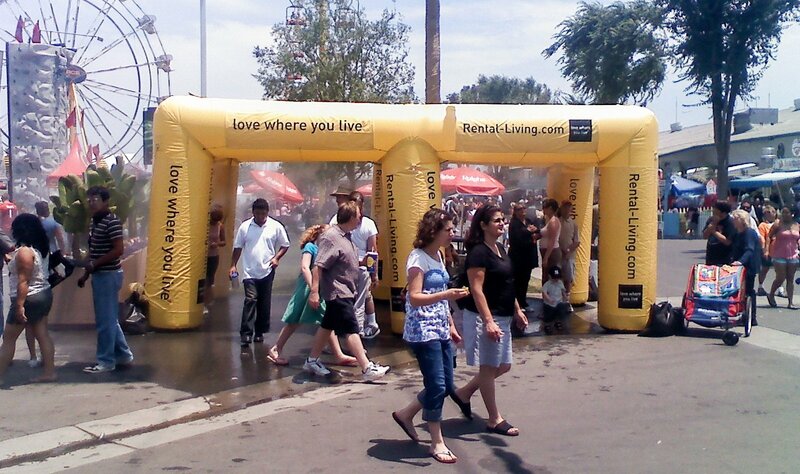 Would you like to see more detailed photos of our cool inflatable misting tents? Check out our mini gallery below!